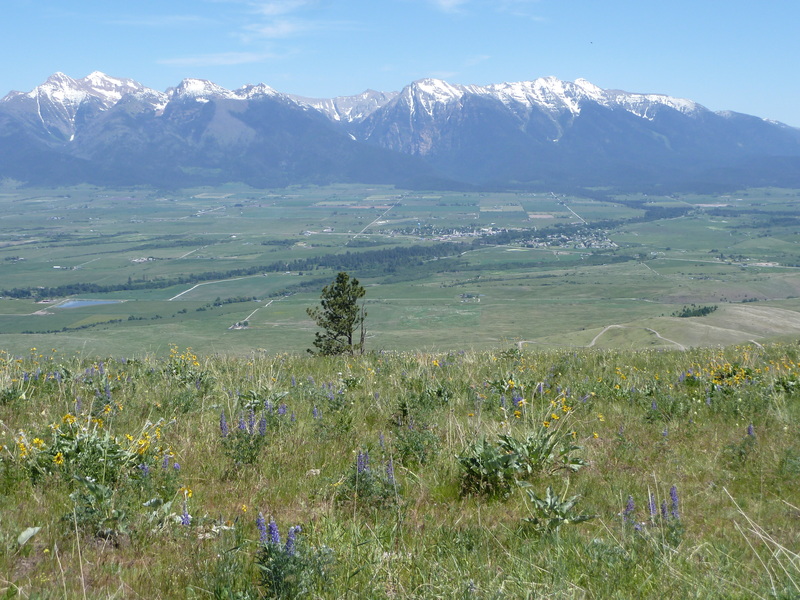 December 11, 2015 – Over 300 acres of land important for birds and other wildlife was conserved in the Smith and Mission valleys this week as a result of two landowners partnering with Flathead Land Trust. The two conservation projects will ensure about 180 acres of wetlands and one and a half miles of streams will be protected as wildlife habitat in perpetuity as well as keeping valuable ranch land in farming. On December 11th, Ron and Carley Iverson donated 142 acres of their land to Flathead Land Trust. Flathead Land Trust will transfer the land donated by the Iversons to the Smith Lake Waterfowl Production Area administered by the U.S. Fish and Wildlife Service. The 142 acres of donated land will be added to a block of conserved lands over 1,600 acres in size that includes the Smith Lake Waterfowl Production Area and private lands with conservation easements held by Flathead Land Trust, Montana Land Reliance, and the Natural Resources Conservation Service. This wetland complex provides a crucial feeding stopover that fuels tens of thousands of birds each year during their epic migration journey. The donation will protect about 141 acres of wetland, a half mile of Ashley Creek, and scenic views for those traveling on Hwy. 2 and the Rails to Trails bike path west of Kalispell. Ron and Carley have owned the property for almost 20 years. The couple has traveled enough to appreciate the beauty and bounty of wildlife we enjoy in the Flathead. They love to listen to the myriad of sounds coming from the Smith Lake wetland complex on a summer evening. They wanted to protect the special habitat for wildlife and future generations. On December 8th, 159 acres in the Mission Valley was protected as a result of Flathead Land Trust purchasing a conservation easement from John Weaver. The 159 acres will remain in private ownership and under John’s management as a working farm, but the conservation easement will ensure the land will remain as open space allowing it to continue to be a working farm and valuable wildlife habitat in perpetuity. John’s 159-acre property has beautiful views of the Mission Mountains and is less than a mile from the National Bison Range. It includes over a half mile of Sabine Creek and a half mile of an unnamed creek (both spring-fed), and 38 acres of wetlands all critical for many species of wildlife including black bear, grizzly bear, white-tailed deer, hawks, waterfowl, and many other birds, small mammals, reptiles, and amphibians. Fireflies even use the property – only the second location in western Montana fireflies are known to occur. John’s property contains many diverse and unique wetlands; one of the forested wetlands with quaking aspen and skunk cabbage has comparable value to a wetland community listed as “imperiled” by the Montana Natural Heritage Program. John not only wanted to protect the valuable wildlife habitat on his land, he also enjoys raising horses on his property and wanted to maintain open space that might otherwise be developed to continue traditional agricultural practices on his rich farmland. Over twenty-five percent of John’s ranch has been designated as “prime farmland” or “farmland of local importance” by the Natural Resource Conservation Service. Flathead Land Trust was able to purchase the conservation easement from John with funding from a North American Wetlands Conservation Act grant they received to protect wetlands and migratory bird habitat. “Purchased conservation easements are a great tool for conserving important fish and wildlife habitat on private lands, especially for those with little or modest income. These private lands are a critical component of the overall landscape for wildlife, particularly as developments continue to degrade habitat and displace wildlife. Protecting wetlands and riparian areas will become ever more important as climate change alters these landscapes and hotspots for biodiversity. I was keen to partner with a respected local land trust (Flathead Land Trust) to conserve these natural values of my property,” said John Weaver. Through this work, and more like it Flathead Land Trust keeps unique and special places like this intact in northwestern Montana that contribute to sustaining our excellent water quality, abundant fish and wildlife, and rich farm soils well into the future.